When California became the fifth largest economy in the world earlier this year, experts attributed the state’s economic success to the financial services, real estate and technology industries based largely in urban and coastal regions. Left out of the economic success story were many of the state’s vast rural regions. California’s rural areas are some of the most beautiful and bountiful in the world. The economies there are heavily based on natural resources and “working landscapes” that benefit the entire state. These regions provide valuable resources and commodities for all Californians, including food, water and open spaces. But many of these regions face higher poverty and unemployment rates than their urban and suburban counterparts, and struggle with a lack of well-paying jobs, limited health care services, and weakened infrastructure such as access to clean drinking water and water treatment, broadband service, efficient transportation and other critical necessities. With small populations and large geographic distances, the assets and contributions of California’s rural regions are often overlooked and not fully appreciated. To address these challenges, the California Economic Summit is advancing the Elevate Rural CA initiative, which has identified three promising “solution spaces” that will combine targeted community, workforce and economic development activities to elevate the rural areas and, as a result, the entire state. The three areas of focus are forest resiliency, water infrastructure and broadband access. California’s forests are in crisis. They are overgrown and millions of trees have been lost to years of drought, insect infestation and wildfires. Elevate Rural CA sees new opportunity in the development of next-generation forest products that could encourage removal of excess wood materials, create living wage jobs, produce engineered wood products to address the state’s housing crisis, generate renewable energy and protect the health of watersheds that provide much of the state’s water supply. Providing clean water and wastewater treatment are difficult for parts of rural California due to aging and inadequate infrastructure and a lack of local financial resources. Also, the watersheds that supply much of the state originate in forested rural regions and need protection and improvements in the face of wildfires, climate change and other challenges. Elevate Rural CA proposes to align and advance innovations in management and financing to improve both constructed and natural water infrastructure to encourage rural economic growth and to safeguard water supplies for both rural and urban areas. Many parts of rural California have inadequate or nonexistent broadband connectivity, which is critical to compete in today’s economy. These “digital deserts” affect not only residents and businesses, but first-responders, health care providers and educational institutions. Inspired by our nation’s history of massive public-private partnerships that brought the railroad, telegraph and electricity services to rural regions, Elevate Rural CA seeks to lift and connect rural communities by closing the divide in broadband connectivity. 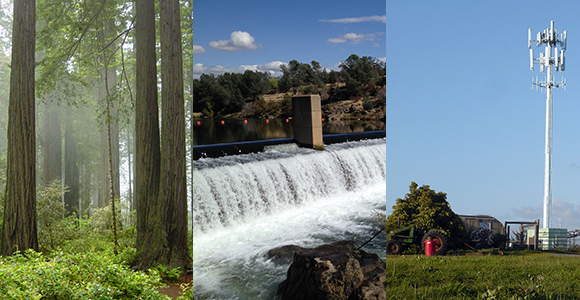 Elevate Rural CA sees potential in its three identified solution spaces – forest resiliency, water infrastructure and broadband access – to help lift the economies and well-being of rural regions, as well as the entire state. Forging stronger urban-rural relationships lies at the core of each of these initiatives. Together, they provide the opportunity for creating greater prosperity, public safety, social and economic equity, and resource sustainability for all of California. These issues will be addressed among civic and community leaders at the 2018 California Economic Summit, which will be held November 15-16 in Santa Rosa.